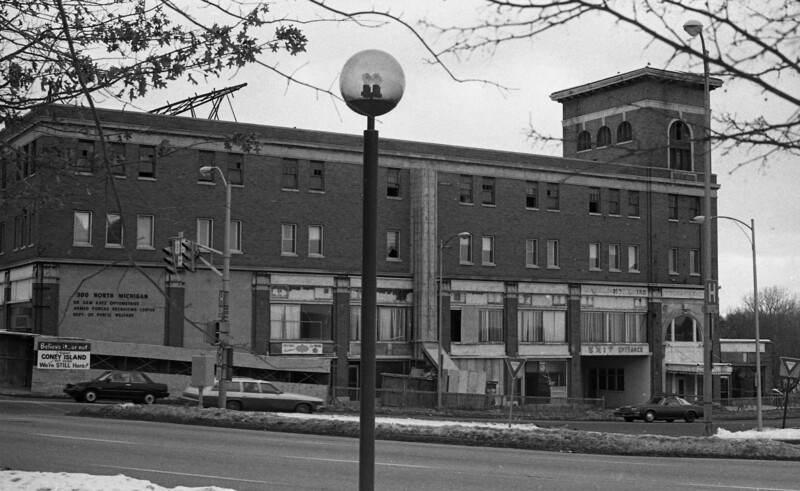 The site that this building sits on has had an important role in South Bend's history. In 1823, Alexis Coquillard, the second white man to settle in the area, built a trading post here. It is also the site of the first ferry crossing (1831), which later would become the location of the LaSalle Street Bridge. At one time, a feed and grain store held this spot. Built in 1925, originally as an annex to the LaSalle Hotel,it became the second of three hotels near this intersection to serve the South Shore station, which was located across Michigan Street. A local architect, Willard M. Ellwood, was chosen for this project. He would go on to design the Hoffman Hotel in 1930. The LaSalle Annex was designed to be a multi-use building, which was a new concept in South Bend at the time. The building contained stores, a parking garage, hotel rooms, bachelor apartments, offices, and a large recreation facilities which included a roller rink, dance floor, and bowling alley. The hotel also featured a Turkish bath on the river level. The LaSalle Annex has had several minor alterations over the years to the storefronts and upper windows.